In this corner, weighing in as County Executive, Barry Grossman. And in this corner, stepping up as Erie Art Museum Director John Vanco. These two men take to the ring in the first Jefferson Debate February 8. You know the story. That faerie tale Upfront's Cory Vaillancourt told you that Erie Reader printed back in August. It was about the old man, who, making porridge in his humble house, receives an unexpected visit from a traveler interested in purchasing a painting hanging in his home. The traveller offers to sell the painting and give the old man the profits to put toward his library, but after thinking the matter over for two weeks, the old man tells the traveler he'll keep the painting for various reasons. You remember the second story printed in Erie Reader too then, right? The one with the headline that read: "Hassam safe, for now: Online activism a 'significant factor'." The story told of how the Facebook group, Save the Hassam!! !, voiced opposition to selling the painting and supported keeping it here in Erie—the city it's been in since purchased in 1904. Fast-forward a few months. 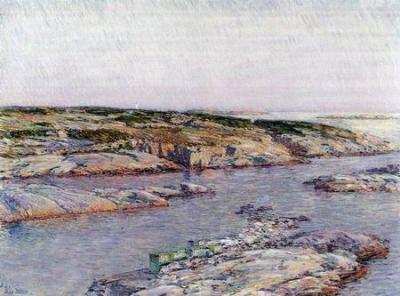 An ownership controversy surrounds the French Impressionist painting, and the idea to contract an auction house such as Christie's of New York to sell Childe Hassam's "Summer Afternoon, Isle of Shoals," is still being considered. But wait. Who's considering it? What's changed? What significance does this painting have to our region? How could a sale benefit or vitiate our community? These questions, among others, swirl about the city winds with no clear sense of direction. "The Jefferson Debate, the newest program offering at the Jefferson, was created to promote balanced discussion about topics important to the general public," wrote Ferki Ferati, executive director of the Jefferson Education Society, in a recent e-mail. The first featured debate focuses on the potential sale of the Hassam painting, a topic quite important to Erie given the press it's received in recent past. "The goal of the first Jefferson Debate between Erie Art Museum Director John Vanco and County Executive Barry Grossman is to raise awareness and answer questions concerning one of Erie's valuable assets, the Childe Hassam painting," Ferati continued. Before you get any ideas of coming to see proverbial guns drawn, a winner declared, and the painting immediately sold or forever pinned to Blasco Library, where it's currently on display, the debate isn't designed to be the be-all, end-all in the argument. "The purpose of this debate, and any future Jefferson Debates, is not to stoke the flame of controversy, but to offer community members an opportunity to hear both sides of an argument, topic, or theory firsthand and in one sitting," Ferati clarified. By doing so, Ferati added, the Jefferson, the city's think tank for community progress, can help "enlighten people about the facts of a situation, rather than focusing on one-sided opinions." To give Erie the facts of the situation and multiple perspectives, JES has invited Barry Grossman and John Vanco to speak on the issue over a luncheon. Grossman said he believes Erie's library, in need of funds to ensure a respectable level of quality for our residents, could benefit from the sale of the painting. "My job, as county executive, is the greater good for the greater number," Grossman explained. "When I took office, I knew our library was on life support, and it's grown worse over the last two years. The state cutbacks have been dramatic. The biggest area of cutback has been toward the money that they give us toward collections. And a library without collections, added Grossman, be it tapes, electronics, books, magazines, "isn't a library. So with that in mind, we had to come up with some way to creatively continue to keep our libraries current and vibrant without going to the tax payers anymore." If sold, Grossman wants to set up a foundation, make an endowment, and insulate that endowment from the political process, ensuring it wouldn't be used for overhead. This came through a resolution he impaneled a committee to write. That same resolution stipulates that the price tag starts at $2.5 million net for the city, and if a buyer submits a lower bid, the painting wouldn't be sold. On the other hand, Vanco suggested that selling the painting would further strip Erie of a cultural heritage it's already lost too much of. "There is constantly some kind of demolition project, tearing down our built environment. For a community of this size and age, there's way too little left of our cultural heritage," Vanco said. "It is a connection to a period of history in this city, a direct connection." According to Vanco, nearly 500 people gathered to contribute funds to the purchase of the painting. The Art Club, now the Erie Art Museum, was created and then tasked with programing the art gallery at the library, which is where the Hassam painting came into play. "It was the intent of those people that that painting and others become a part of the permanent heritage of the community," Vanco said. He went on, citing several key issues in his argument: "The owners' intention is that it stay within the community, that the community has little enough else left—and that reason alone it ought to stay in the community—and that it exemplifies this attitude that we can just throw stuff away, we can shortsightedly sell things off for the wrong purpose and we're left with nothing. We have little enough now." Grossman said he plans to focus his argument on the facts that: a need for a "vibrant and up-to-date library;" the fact that no alternative source of funds has been established; and the idea that selling the painting could benefit our local culture. "We ought to take those funds and guarantee that it only improves cultural and literate aspects of our community, not to be used for parking lots and maintenance," he said. "Out of this sale, we have enriched our community in all cultural ways, whether it's poetry, music, dance, everything, not just on the basis of one painting." Both men said they were looking forward to the debate and see it as an exchange of ideas and means of educating the public on an issue that matters to the area. Both stated that they would not argue the ownership of the painting since that is a legal issue. Both noted that this has been a debate the city's had before. "What I want to avoid is another battle. This is the third time I've fought this fight and others have fought this fight," Vanco said. "We fought back against it, and wisdom prevailed, but I don't want to have to fight this again 10 years from now. Let's resolve this; let's put the issue to rest." Grossman said that his goal isn't to "sell the Hassam at all costs," but thinks that until another viable option is introduced, the possibility of selling the Hassam "is something that always must stay as an option." The Jefferson intends to host four or five debates every year with far-reaching topics in hopes of covering as many issues as time allows. To learn more about the current conversation circling the Hassam painting, make reservations to attend this February 8 luncheon now by contacting the Jefferson Educational Society at 459.8000.